The Internet is an entertaining place. Aside from communicating with friends and family as well as acting as one giant encyclopedia, the Internet also provides a plethora of fun, in particular, senior online games. There are tons of these games for seniors available, ranging from those that sharpen your cognitive skills to those that are simply an easy and enjoyable way to pass the time. But with hundreds and thousands of senior online games available right at your fingertips, sometimes it can be a little overwhelming to find the best ones. So, we’ve checked out a few sites in order to compile a list of the best (and free!) senior online games. AARP features a collection of senior online games such as chess, puzzle games, brain games, word games, card games. They also have multiplayer games, or rather, games where you can play against other people that are currently playing online. Ice Cream Blast: How to play: Match and drop ice cream toppings on the cones. You also try to decorate as many cones as you can to earn points at the end of each game. Find-O-Vision: How to play: On the right side of the TV, you will find a list of items that you need to find right on the TV screen. Complete the search to unlock each level. If you’re passionate about chess or even if you’re just starting to learn the game, Chess.com offers a variety of options for you to play online chess or join a tournament; play chess via Facebook or against the computer generated opponent. You may download the game on your mobile device or just play it any time using any browser — no download necessary. TheJigsawPuzzles.com site offers a beautiful collection of jigsaw puzzles you may put together. Choose from a range of 20-piece puzzles to puzzles consisting of 500 pieces. Different styles and cuts are available including classic, elegant, mosaic, square, and spiral cuts. The jigsaw gallery contains a variety of categories such as animals, great sightings, street view, bridges, flowers, people, castles, and more. Shape Inlay: How to play: Drag differently shaped tiles from the bottom of the screen and drop them in the puzzle area to fill up the shapes. Press the spacebar to rotate the piece. The larger tiles are used, the higher the points. To discard a tile, drag and drop it to the hole on the left side of the screen while your total score will be deducted. Don’t let the tiles pile up in the bottom of the screen or the game will be over. Check out the post, adult brain puzzles. It has more great ideas for senior puzzles. EastoftheWeb.com features fun and exciting word games. MultiPopword: This is a 3-minute, multiplayer game (this means you get to play with anyone in the multiPopword room) where each player receives the same set of letters to play with. Top scores will be revealed at the end of each game. How to play: Click and drag across adjacent letters found in the grid then release the mouse button once you’ve selected a word. The succeeding letter you’ve selected must be directly next to the letter previously selected either horizontally, vertically, or diagonally. Each selected word that is valid will pop, allowing the letters above them to fall and take their place and for new letters to be dropped in order to fill up the grid. The longer the word, the more points you get. The maximum length of words you can “pop” is 8 letters. Whoever tires of playing the classic Scrabble? This site features your all-time favorite Scrabble game! This site welcomes both beginners and master players as they feature a wide selection of mahjong games you can choose from with different themes like war mahjong, mahjong tower, mahjong gardens, mahjong 3D, and more. Text Twist: How to play: Form words from the letters provided by clicking on the letter discs. Click on the TWIST button to scramble the letters for you to be able to see other words. Guess the bingo to qualify to the next round. Treasure Hunt: A fun game with a pirate theme, this game also helps sharpen your memory. How to play: A number of items found in a pirate ship’s room will be displayed. Try to remember as best as you can. As you continue, click on the items which you think have changed in the room. Earn gold coins for each changed object that you have identified. Guess the required number of items to be discovered and you will qualify to the next round. As the game progresses, more items are added and the more number of items you need to find to get to the next level. Gardenscapes (Mansion Makeover): This game enhances your visual acuity and time management skills. How to play: In a room full of clutter, find the objects that are on the wanted list posted on the left side of the screen. Earn money for each object found. 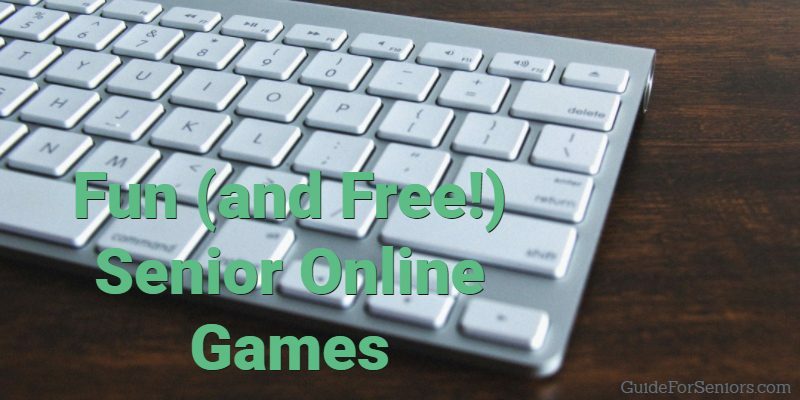 Senior online games are fun and even more thrilling when they are free. However, you can always read a book or just plant a garden. Who can resist seeing a small seed grow into a plant, especially if you are the one who planted it? Find other ideas for senior entertainment at the Guide For Seniors. Your imagination is endless! See more brain health tips on Guide For Seniors. We are always working to make your life and your brain better! Read more on Guide For Seniors for ways to help seniors and their health.